After completing our northerly C2C2C, Shaun and I immediately pressed on with arranging the next ride on our bucket list. This was to be the Great Glen Way, running between Fort William and Inverness. I also had a professional interest in this as we get lots of customers hiring bikes to go this route and I was curious to see exactly what it was like, having only previously cycled the section between Fort William and Fort Augustus. I was also wanting to understand why so many mountain bikers seemed to write it off, and what might be the best type of bike/tyre for it. Our logistics this time were much simpler. Shaun would drive us both to Fort William and my wife would meet us in Inverness, ready to drive south back to Fort William. The GGW makes a strange start through the streets of Fort William and Inverlochy and it's sometime necessary to differentiate between NCN78 and the Great Glen Way as you go. Of course, it's all easy pedalling out to the end of the canal, up the side of Neptunes Staircase and onto the long, flat canal section all the way to Gairlochy. For us, the weather was fine - a few puddles and a mild tailwind - but I've cycled against a howler of a wind along here and so know that the canal-side can be very exposed. At Gairlochy there's a short section of road before the Great Glen Way is signposted off to the left. This section, and the part by the loch that follows it, is a pleasant singletrack diversion through some lovely woods and a couple of decent picnic/bivvy spots. The road along here is signposted as NCN78 and is quiet enough too, so anyone looking to stick to easier surfaces has an option. The two options (GGW and NCN78) come together again for a short distance before both carrying on along some forest track at Clunes. This undulates enough to provide a bit of height and the occasional view along Loch Lochy before returning to tarmac at Kilfinnan. It was here that I spotted two cyclists coming towards us, both loaded up with camping gear. I recognised them as participants in the Highland Trail Race and stopped for a quick natter. I think they were both surprised at the amount of attention their exploits had been achieving and as we left them to carry on South I couldn't help feeling it was putting our little expedition into some sort of perspective! Past Laggan Locks and we were back on to the newly-surfaced NCN78. While I can appreciate the difference this makes for easier cycling, I couldn't help but look on at the old loch-side route that can often be seen alongside, gravelly, muddy and root-strewn, with a little sadness. It's big, but is it clever? 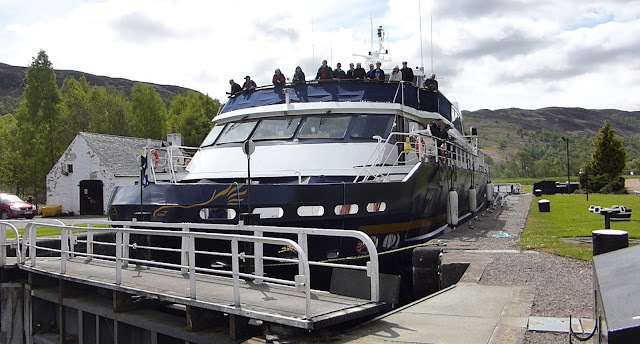 Just outside Fort William, we had to cross a set of locks and saw the largest boat I'd ever seen on the Caledonian Canal. We stopped for a brief chat with the lock-keeper who confirmed that it was just below the maximum dimensions for the locks - and had, in fact, been shortened as it was originally 2 metres too long. It certainly filled the lock, especially as the water level lowered. We definitely don't need a bigger boat! Always keen to keep the tummy occupied, it was time for a lunch stop in Fort Augustus. Luckily, it was pleasant enough outside so we commandeered a table overlooking the canal. It had taken us a little over 3 hours to reach here, despite a couple of wee stops, so I was happy that we were making decent progress. I also knew that all of the climbing was yet to be encountered so didn't want to hang around too long. Leaving Fort Augustus, it wasn't long before we encountered the first steep climb. Having already decided that we should take the High Level variation of the GGW, I knew that there would be quite a bit more climbing and wanted to make sure I had legs for the rest of the day so it was off the bike to push up for a while. 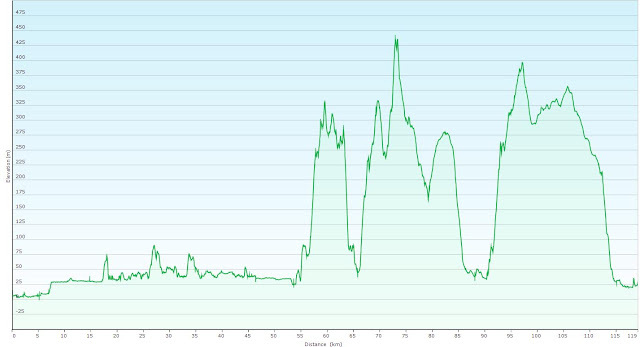 A look at the figures shows that this was a 300m climb in around 5km. The big advantage of this though was that we were treated to some great views back to Fort Augustus and beyond and also up along the rest of the Great Glen. The track along here swoops over the terrain and we found it about 95% rideable, with just a couple of very steep sections to test the legs a bit. Dropping down into Invermoriston, the path was more reminiscent of a Blue/Red graded MTB Trail with suitably impressive drop-offs. Of course, reaching the loch level at Invergarry required another big climb out and this time there was a lot more pushing as we negotiated the zig-zags through the woods. It would be fair to say that I was in some need of refreshment by the time we reached Drumnadrochit. Thankfully, the scones at the Fiddlers did not disappoint, coming with a massive dollop of fresh cream. I was, however, keen not to sit around too long as I know my legs get difficult to "re-start" and that there was yet another big climb coming up. In fact, Shaun almost missed the start of this one where it turns off the A82 pavement. Either that, or he was secretly trying to find a faster way to the end. The scenery hereabouts was quite different to that we'd been seeing earlier, with more farmland and signs of actual human habitation. The GGW was lovely though, with sections through a narrow tunnel of gorse and whin that swept to and fro. Having heard about the wonderful cafe at Abriachan Woods, I was keen to try it out and all the lovely handmade signs as we approached it lent it a strange charm of its own. However, knowing the end was almost in sight, we agreed to plough on to Inverness so I'll have to make a special effort to pass this way again sometime soon. Having got all this way on what were surprisingly dry tracks, the wet and mud through the forest at Craig Dunain came as a wee bit of a shock. It certainly went some way to explaining why so many of the bikes I see arriving in Inverness are filthy. Coming into the suburbs of Inverness, the GGW gets a massive amount of signposting to take into account the various streets and paths meaning we had to pay a bit of attention lest one be missed. Finally crossing through the Ness Islands left us with a wee carry up some steps to get onto the last wee kicker to the castle and the official end of the GGW. So, that was the Great Glen Way. Having completed it, I can honestly say it's a great route. The new high level sections obviously make it more of a challenge (in fact, I'm now planning to do the low level options to see what they are like) and it felt like a perfect, long day out in the hills. 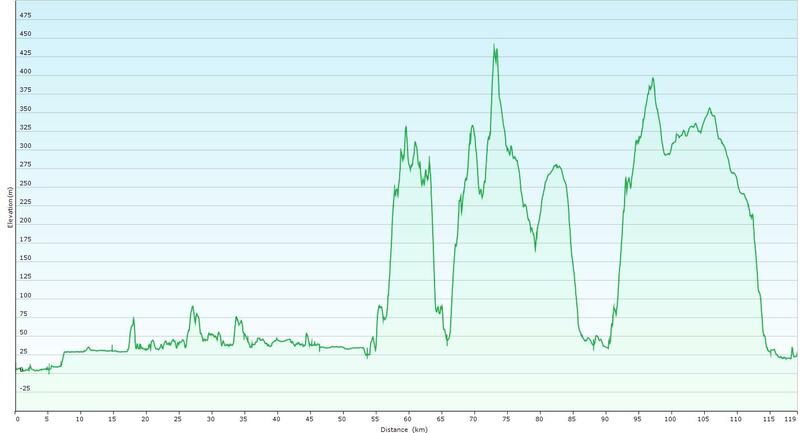 The figures show we did 119km with 2,148m of ascent. We were riding for just under 8hrs30m. A ride of two halves!